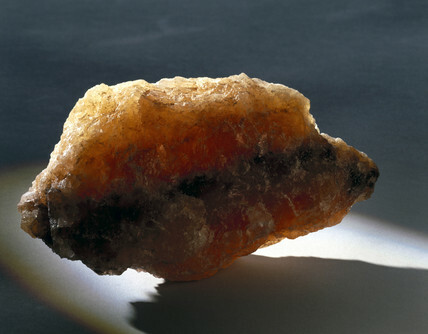 This sample of Triasic rock salt is approximately 230 million years old. Populations of Haloarcula bacteria were isolated from within the rock and cultured by Bill Grant of Leicester University during the 1990s. It is posible that these micro-organisms have lain 'dormant' since the salt was deposited, but more likely that they are the descendants of those alive in Triasic times. Their viability demonstrates the resilience of living organisms and the reason why such micro-organisms may one day be found in extra-terrestrial environments.